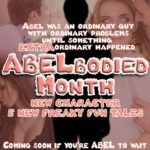 Meet Abel, a real down to earth ordinary harmless guy with typical fantasies and desires who one day has a strange encounter, after which… anything can, and will, happen. Look for the ABEL series all month long, a five book limited series from the Kreme! Thirsty for an uncensored cover? The rules for book covers means that there are, from time to time, a cover that isn’t acceptable to Amazon or Smashwords because it shows off a little too much. For readers of the Kreme, here’s the original book cover for Thirsty to enjoy! The month of mystery is approaching… HallowKreme 2016 is almost here! Look for new surprises from the Kreme in 2015! New series on offer! Old classics made new! And of course many surprising Kreme specials that you’ve come to expect! Happy New Year to One and All! Lifting the covers from Reader’s Choice Month 2! As a bonus for the Kreme’s readers, here’s the uncensored cover for Korporate Kreme! The Kreme serves up specials for Read an eBook Week! 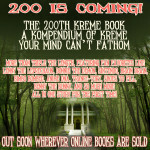 Every so often there is a cover that just can’t be used for the Kreme’s books. While they cannot be used as the official cover, they can be seen here. Here’s the uncensored cover for Paranormal Ending and look for a new release this week!